On Thursday quotes of the currency pair NZD/USD grew up. After the release of the weak data on number of initial applications for unemployment benefits in the USA, the pair reached two-week highs at the level of 0.8640. The state of American labour market causes misgivings among investors. Number of claims for unemployment benefits has increased in April, putting additional pressure on the American currency. The latest data showed that number of unemployed increased by 344 thousand, which is the highest level since February. Today’s key news is the US data on number of new jobs outside agricultural sector in April and unemployment rate. Experts expect that the news will be favourable for the USD; number of new jobs will increase by 210 thousand, unemployment rate is expected to fall to the level of 6.6%. 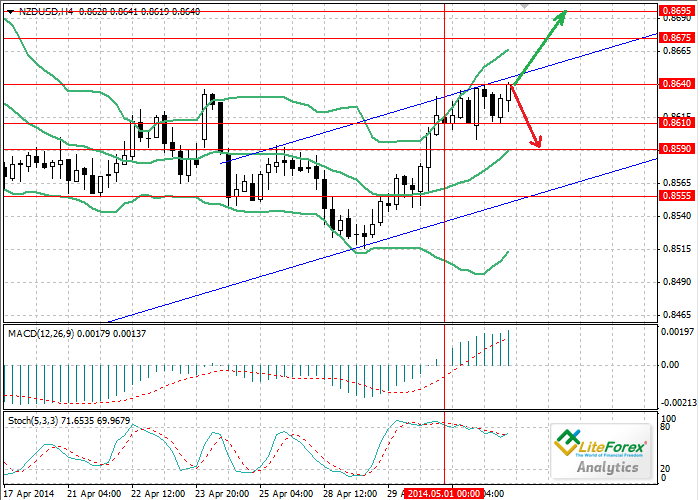 Currently, the pair continues to test two-week highs at the level of 0.8640, but cannot consolidate above this level. If American labour market data will be equal to investors’ expectations, the price may experience correction to the level of 0.8590 (moving average of Bollinger bands). In case the data is negative, the price can go up to the levels of 0.8675 and 0.8695. Technical indicators confirm possibility of the upward movement. Bollinger bands are directed upwards. MACD histogram is in the positive zone, its volumes are increasing. Stochastic lines are crossing and ready to turn up. In the current situation it makes sense to place long positions if the price consolidates above the level of 0.8640. Take profit is recommended at the level of 0.8695.